Moonlight Magic Kicks Off the Holiday Season in Shelburne Falls This Friday! Thanksgiving is this Thursday! While I am looking forward to spending time with family and reflecting on what I am grateful for, in the back of my mind I am thinking about Moonlight Magic. Moonlight Magic is the annual holiday kick-off event in Shelburne Falls. 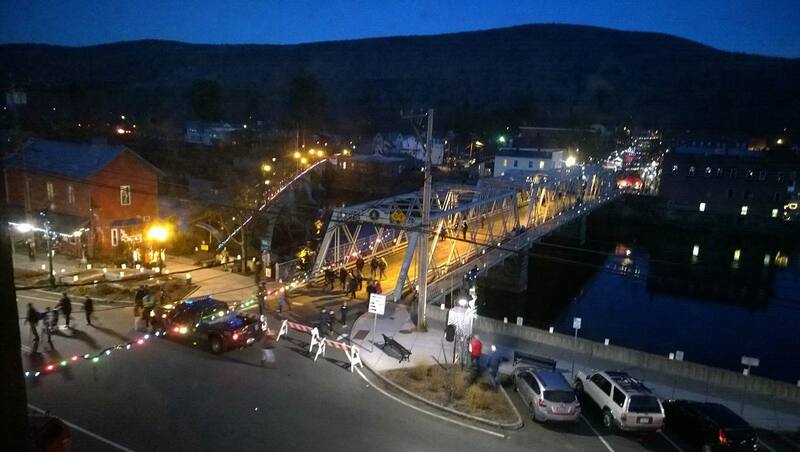 Every year on Black Friday, which this year is November 24th, from 4-9 pm, the Greater Shelburne Falls Area Business Association closes off Bridge Street and the Iron Bridge to host this magical event. Vendors will line the streets, selling crafts, candles, maple and other farm products, wreaths, and other delightful things perfect for gifting for the holidays. Barberic Farm will be selling their delicious frozen meat pies, jams, jellies, pickles, plus their handmade wool and leather products. Shelburne Farm & Garden will also have a booth, selling birding supplies, pet toys, hats, and gloves. You could get all your holiday shopping done without having to even look at a mall! School groups and other non-profits will also set up to fundraise for their special projects. Colrain Central School will be raffling off gift baskets, and Hawlemont Elementary School will sell baked goods and offer cookie decoration as a fundraiser for their Nature’s Classroom trip. Of course, don’t forget to look for the Salvation Army kettle to make a donation. While you’re shopping around, there will be a bunch of performances, both indoors and out. Keep your ears open for roaming performers, Welcome Yule, a group of carolers, and Tom Crean, banjoist. At 5:15 pm, be sure to be outside to watch the Parade of Lights come down Conway Street to Bridge Street. Wave to Santa Claus and his crew, plus a special horse drawn wagon courtesy of Greenfield Savings Bank. Then, pay Santa and Mrs. Claus a visit at the Mason’s Lodge on Main Street. Some other acts you won’t want to miss include Ageless Waves of Rhythm, the Senior Center’s drumming group, who will perform in Greenfield Savings Bank, and Celtic Heels, Irish step-dancing group. My favorite part of Moonlight Magic are the beautiful lights and decorations throughout the village of Shelburne Falls. Luminaria line the streets and christmas lights and garlands drape overhead, making this cozy village even more serene. For more information and specific event details, go to shelburnefalls.com.